The sidewalk and parking spaces under and near the canopy remained blocked on Jan. 4. 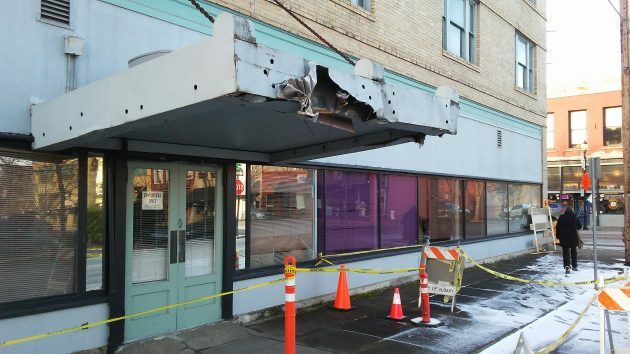 It’s been a couple of months since a passing railroad maintenance truck got too close and mangled the canopy over the old entrance to the former St. Francis Hotel. The owner says the Portland & Western is ready to pay for fixing the damage to this downtown Albany landmark, but getting it done appears to be more complicated than it looks. I noticed the damage in late November and asked Scott Thorn about it on Dec. 6. He’s the owner of Pride Printing, which owns the former hotel and operates on its ground floor. (I was there because the shop had made poster-size color prints from images taken on my phone, and they did an outstanding printing job.) Scott told me what had happened. The truck — the kind that can run on rails as well as pavement — was turning on to Ferry Street when part of its topside equipment snagged the canopy. Scott was in his office at the time and from the noise, he said, it sounded like the building was coming down. When it was sorted out what had happened, the railroad apparently engaged a Eugene contractor to make repairs. A couple of people from the Albany building division went to look at the damage. “It didn’t appear to be unstable and in danger of falling, so we didn’t issue a notice for it to be removed or repaired at once,” said Mary Gaeta, senior code compliance inspector. But if the canopy was to be altered — shortened, for example, to avoid any more collisions — an engineered design would be required. In addition, though, an exterior alteration of an historic building — which the St. Francis is — would need a review by the city planning staff and perhaps the approval of the Landmarks Advisory Commission. The perfect opportunity to remodel and reopen the St. Francis as a hotel, certain to be kept busy by the crowds certain to mob the CARA-sell once that Merry-go-round is up and running. We are the government and we are here to help………. I am the authority. Bow down and praise me as, I alone, can fix this. Governed or Ruled….guess you made your choice! A perfect example of governmental over-regulation and bureaucratic measures. Somebody’s job relies on doing “studies” and enforcing rules, so it will take ten times longer and cost ten times more than it should to get the job done. We need to get rid of all the fat in our government.